Quick posting before bed time. I'm off to NYC tomorrow. YAY!! Not looking forward to the 17 hour flight though and hope I can sleep through it. Hubby has to go there for business and I had the opportunity to join him, so of course I jumped at it. This also means that I won't be able to do any work or blog for the next week. I'll be back the week after, so I hope I have lots of photos to share then. Anyway, back to this tag. 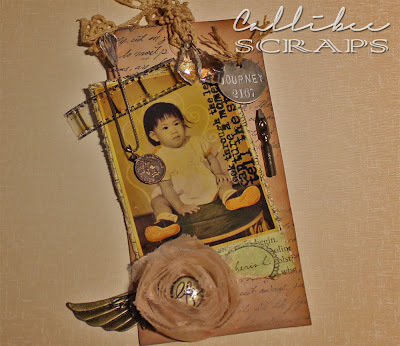 This is based off of Tim Holtz's June tag. The photo? That's me at around 18 months. When I look at this picture, I'm always taken back by how much Miss C looks like me at that age. I'll have to post a comparison when I get back. For my tag, I've used most of the same techniques that Tim has, although my embellishments are different. I don't have half the stuff he has and like anyone else, I simply improvise. I'm not going to list out the products I used as most of it was sourced locally and has been in my stash for a while. I do like how this has turned out. I love your tag Grace - what a cute photo! Have fun on your trip.